Camping is a great Ontario summer tradition. Packing up the car, hitting the road and going on a camping adventure is a great way to spend quality time with the family. But sometimes you don’t want to venture too far from home with little ones. 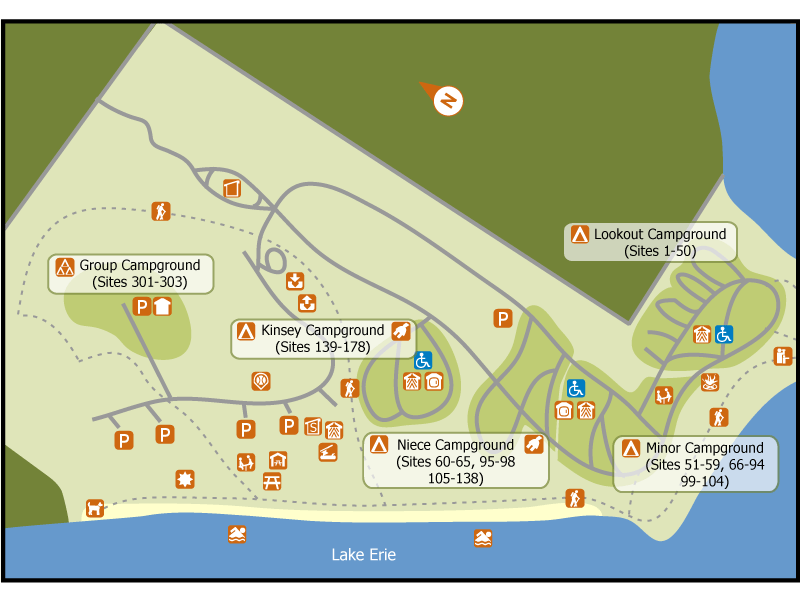 We’ve put together a list of campgrounds in Niagara and added a few just outside the Niagara region. Please let us know of any other gems we may have missed! We hope you enjoy your camping adventures this summer! Swimming: A waterpark with a giant pool and boardwalk, water slide, and a kiddie splash pad for children under 8 years old. Camping: Kinsey and Niece camping areas offer electrical campsites and can accommodate equipment ranging from large trailers to tents. Swimming, access to hiking trails and the Park Store are nearby. Minor and Lookout camping areas do not offer electrical service but the campsites accommodate tents to small trailers. 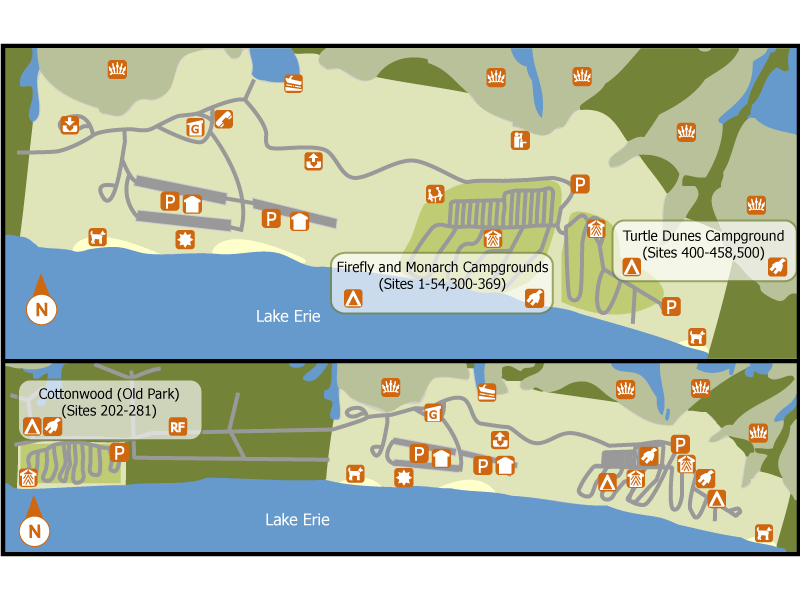 Waterfront trails are easily accessed taking you to the park beach or to the limestone shelf that juts out into Lake Erie. Swimming: There is a 1 km natural sand/pebble beach that runs from the campground to the day-use area. Hiking: Woodlot Trail – 2 km. Explore a variety of forest and wetland communities including Carolinian, Oak Savanna and old farm fields that are slowly being reclaimed by the forest. The trail will lead you to a viewing platform built on top of the park’s sand dunes overlooking Lake Erie. Pet Exercise Trail – .5 km linear trail. Other Amenities: Boating and fishing. Swimming: Waterpark, 5 acre spring fed quarry (15-40 ft. deep), with high & low diving area. Watertoys in the quarry consist of: 2 trampolines, rock-climbing wall, Saturn, moon-walk, teetertotter & a catapult. Over 200 ft. waterslide which empties into its own 4 ft. pool. Large 2 ft. deep kiddie pool with jets. 3400 square ft. splash pad with rubber top and water-guns & a large mushroom. There is also a sandy beach area. Other Amenities: Organized family events, Horseshoes Pits (Just bring your own horseshoes) , Baseball Diamonds, NEW Skate Park For Kids Added, Full Basketball Court, Volleyball Court, Campers Sand Volleyball Court, Fenced Dog Run Area, Soccer Field, Kids Basketball Area, and Kiddies Playground. Camping: A family run campground, located in a peaceful valley in Southern Ontario. Trailer, Pull-thru, 5th wheel, RV, and tenting. Swimming: A heated pool, hot tub, and splash pad. Other Amenities: A playground, natural pond, horseshoe pits, basketball,volleyball, weekend activities, and walking trails. Camping: All campsites offered at Turkey Point are car campsites. There are 26 pull through campsites; a number of which will accommodate larger trailers and motorhomes. Swimming: Great 2km beach in the village of Turkey Point – shallow, buoyed swimming, great for kids. The beach is very sandy and safe for swimmers, especially children. The water is generally warm with a sandy bottom and there is no undertow. Hike from the park office to the edge of the bluff overlooking Long Point Bay and return. Camping: Firefly Campground offers large pull-through sites equipped with electrical service. Located on the bay side of the campground, they are a short five minute walk to the beach. Monarch’s Rest and Turtle Dunes Campgrounds offer some electrical sites that are able to accommodate a variety of equipment. The premium campsites, located in the dunes at the ends of the loops closest to the beach, offer a soft sandy base. The Old Park section of Long Point includes Cottonwood Campground, a radio-free campground. The sites can accommodate a variety of equipment sizes. Premium campsites are located at the ends of the loops and are very close to the beach. Swimming: Large, sandy beaches are located by Monarch’s Rest and Turtle Dunes Campground and the Day-Use are in the New Park as well as Cottonwood Campground in the Old Park. Over two kilometres of soft sand and warm water. Other Amenities: Excellent fishing and boating opportunities in Long Point Bay. Camping: The park setting offers a variety of sites to choose from for RV or tent camping. From quarry view sites to shaded tree sites, there’s a location to suit your preferences. Swimming: There’s a sparkling and calm quarry and a soft sandy beach. There’s a swimming platform and a new Splash Zone in the quarry. Other Amenities: Volleyball, basketball, paddle boating, and a play ground for the kids. Swimming: The abundant beach shoreline is Long Beach’s main attraction. The sand and pebble beach is a natural playground for those who swim, sunbathe, fish, sailboard or jet-ski. Other Amenities: Fishing, bocce ball, horseshoes, baseball, and a playground. 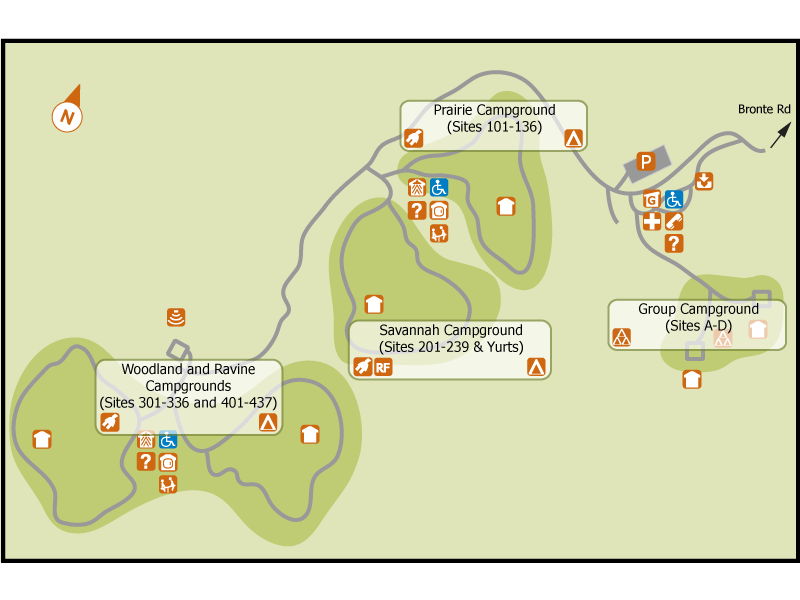 Camping: Byng Island has 380 campsites in four main campgrounds, each providing different features: forested, riverfront, serviced and access to the Grand River. Swimming: The two-acre pool is one of the largest in Ontario. It has a wading area and spray pad for youngsters, as well as a deeper zone with a diving board. Hiking: A two kilometre nature trail on the west side of the park offers an opportunity to discover a Carolinian forest. Other Amenities: There are plenty of programs to keep children and families busy throughout July and August, from Pirate Day to a mini-Olympics. There is a play area for children, two sand volleyball courts, a baseball field and large open areas for group games. Three concrete boat launches provide access to the Grand River (above and below Dunnville Dam) as well as Lake Erie, which is about 7 km downstream. You can rent canoes, kayaks and paddleboats for exploring the river and Sulphur Creek. 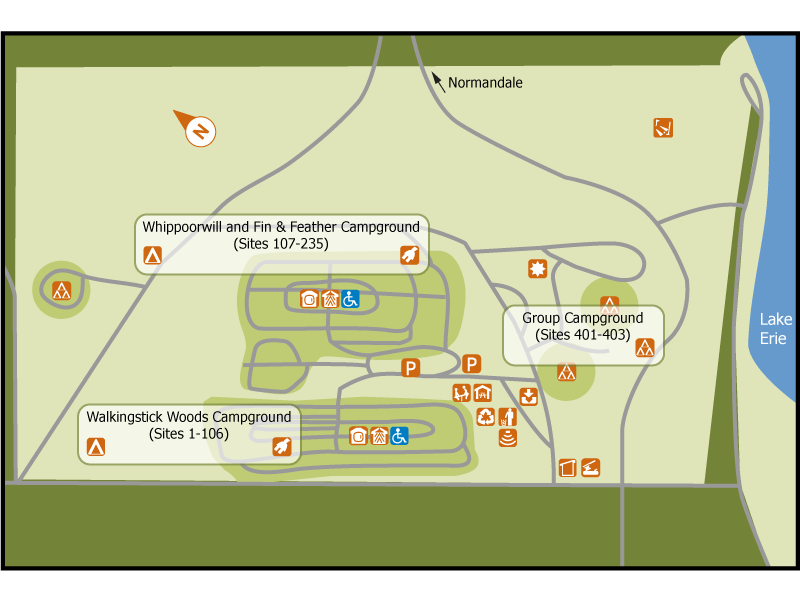 Camping: Quiet campground with grassed campsites. All campsites offered at Selkirk are car campsites. Most campsites located in Areas 2 and 4 can accommodate larger trailers, are pull-through and most offer electrical hook-ups. Swimming: There is a small beach in the day-use picnic area. There is a larger, natural beach fronting the lake however it tends to be pebbly. The water fronting the beach has a gradual drop off. At first entry it is a bit stony but turns to sand soon afterwards. Hiking: Wheeler’s Walk Trail – 1.5 km, 30-40 minutes, easy. This trail takes hikers from the campground side of the park across a marsh wetland, via a boardwalk, to the west side of the park. You will travel through remnants of the forest that pre-date the park and through a White Pine plantation that was planted in the early 1970s. Other Amenities: Boating and canoeing. Swimming: Two large pools, kiddies splash pad, playground, paddle boats and more. Other Amenities: Fishing, paddle boating, family activities, basketball, volleyball, baseball, soccer, horseshoes, and bocce ball. Camping: Rockwood has about 46 serviced campsites (electricity and water), 16 full-service (water, hydro and septic) and 43 unserviced sites. Swimming: There is a large sandy beach on the reservoir. Hiking: Two trails take you around the reservoir, along the tops of cliffs, across boardwalks through wetlands and beside big glacial potholes. Be careful around the cliffs and steep slopes! Other Amenities: Towering limestone cliffs, caves and glacial potholes, including one of the world’s largest, are a few of the natural wonders at Rockwood. You can view them from hiking trails on both sides of the Eramosa River or in a rented canoe. Throughout the summer, Rockwood Park offers interpretive programs and other activities for families and children. Swimming: Dils Lake, a 10 hectare man made reservoir, is the perfect spot for swimming. 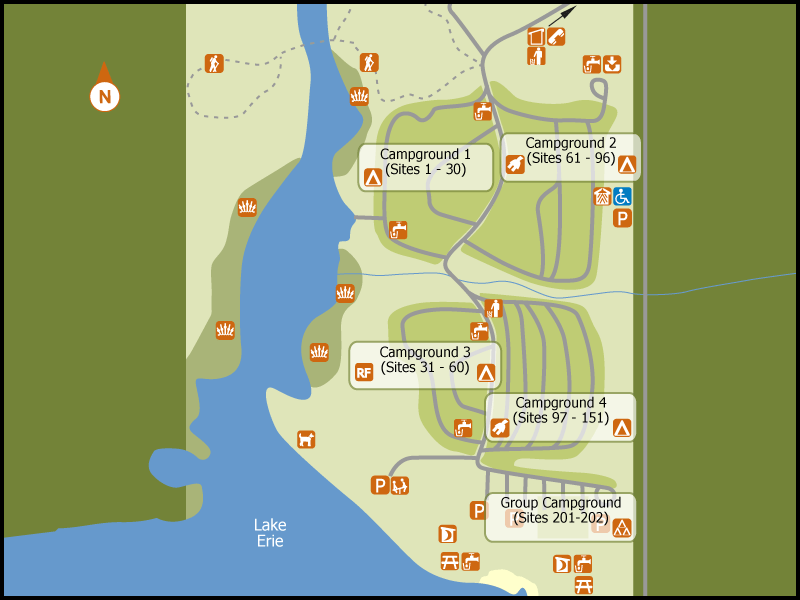 Camping: Shangri-La Niagara has 250 sites available (each with water and electrical services) on 48 acres of scenic land. If you don’t have a tent or trailer, you can stay in one of Shangri-La Niagara’s beautiful cabins located in a private forest. Each cabin is fully insulated to keep warm when it is cool & cool when it is warm. Each cabin has electricity & heat for those cool nights. Water & washroom facilities are nearby. The cabins have a loft for children to sleep in and a wall bed for the adults below. Each cabin is uniquely designed and features antique furniture and accents. Travel back in time to live as the pioneers did by staying in one of Shangri-La Niagara’s cabins in the the forest. Swimming: Cool off from the summer heat by enjoying the 42ft x 80ft outdoor pool. They also have a separate wading pool for the little tykes. Other Amenities: Enjoy Yogi Bear’s extra large playground area. Soft sand fills the area between our 6-piece playground area. There is a tire run, jungle gym, monkey bars, swings, a train and two giant slides to name a few! Come bounce away on Jellystone’s Canadian Inflatable Trampoline. This jumper is one of the largest bouncers of it’s kind! Race your friends down the road or go for a leisurely ride around the grounds with your family – with over 15 bikes to choose from the perfect Pedal GO-Kart for your family is available at Jellystone Park! Camping: Bronte Creek offers car camping in all four of the campground loops. The Prairie loop is designed to accommodate larger RV’s but will easily accommodate smaller trailers or tents as well. The Savannah, Woodlands and Ravine Loops are ideal for smaller trailers < 25 ft and tent camping. All campsites have electrical hook up for each campsite. Bronte Creek offers three yurts for rent. All three are located in the Savannah Loop which is designated as radio free. Hiking: Five great hiking trails (1km-3km) that showcase the natural beauty of the park. Camping: Valens Lake is a popular family campground with 225 campsites, including 125 sites with electrical and water hookups, 9 group areas and walk-in sites. Swimming: Any summer day, swimmers and sunbathers can enjoy the sandy beach, and natural swimming area. Hiking: Ten kilometres of trails and 300-metre wetland boardwalk. Visitors can also climb the observation tower, offering a stunning view of the surrounding forests and lake. Other Amenities: Explore Valens Lake by boat in a kayak, canoe or rowboat. All are available for rental for half or full days. Fish from the boat or just enjoy the scenery and wildlife of Valens Lake.